I think the most that I’ve learned has been, how do I put this? The innate goodness inside of all of us. And, I think that is actually appropriate because I’m really not the world’s best programmer, I think it’s a good thing that I’m not touching the code. Certainly I get a lot personally out of it as well, there’s the recognition and things like that but mostly I try to take that as an opportunity to explain why I hope we could see more projects like Apache out there and why it’s a good thing for society. So that’s my main role right now and really the politics also includes going out and communicating to the world why Apache is a good thing, why companies should be involved in it, and why individuals should be involved in it too. 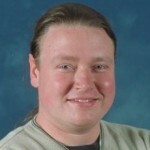 Brian Behlendorf is an American computer programmer, technologist and an important figure in the open-source software movement. He was a primary developer of the Apache Web server, the most popular web server software on the Internet, and a founding member of the Apache Group, which later became the Apache Software Foundation. Behlendorf served as President of the Foundation for three years. Behlendorf has served on the board of the Mozilla Foundation since 2003, Benetech since 2009 and the Electronic Frontier Foundation since 2013. Behlendorf was an early participant and the chief technology guru for the Burning Man festival, and also founded a large online resource devoted to electronic music and related subcultures.